Giving back to the grassroots of the game that has given them so much never gets old for the members of the NHLPA. The Players' NHLPA Goals & Dreams – the players’ program that has donated over $23-million to over 33 countries since 1999 – once again made an impact with young hockey players on Thursday night, in the community of Kitchener, Ontario. 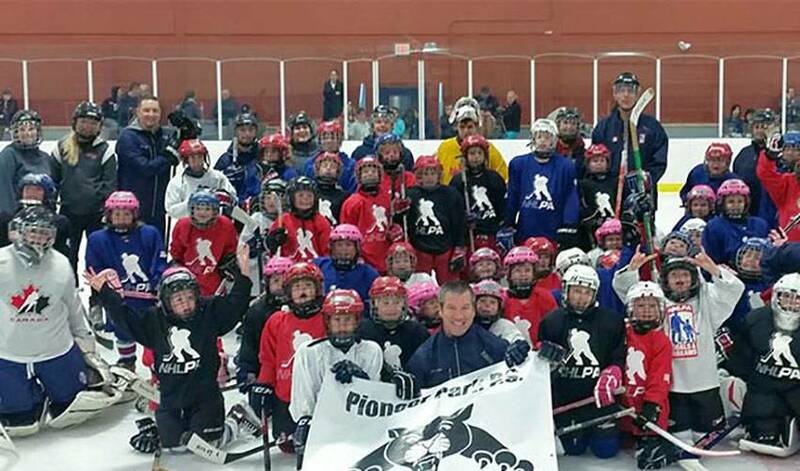 The Pioneer Park public school hockey program was the recipient of the Players’ generosity, in the form of 25 complete sets of new equipment valued at $12,500 CDN, for the kids of the program to use as they develop their love of the game and the skills and friendships that come along with playing the fastest game on ice. Former NHLPA member Scott Walker (Vancouver Canucks, Nashville Predators, Carolina Hurricanes, Washington Capitals) was in attendance on behalf of the Players and NHLPA Goals & Dreams to announce the donation, as well as lead an on-ice skills session and sign autographs for the children of the Pioneer Park Program. The donation will directly impact the school’s hockey program and give the students there an opportunity to suit up and play the game of hockey. Donations from NHLPA Goals & Dreams over the years has also allowed the program at Pioneer Park to expand significantly since its inception. As always, the event was a rousing success for the people involved and was especially well-received by the children who got the chance to try out the new gear. Once again, the Players have succeeded in giving back to the grassroots of the game and have enhanced the experience of hockey for those involved.